If there is one ride in Fantasyland that can rival It’s a Small World for the title of “Most Classic Disney Attraction,” I really feel Peter Pan’s Flight is it. Peter Pan has been taking guests on a journey to Neverland aboard a flying pirate ship for decades and the lines are still among the longest in the park. Why has this ride stood the test of time when other classics like Mr. Toad and Snow White are given their pink slips? I can only attempt to guess, but I think everyone can connect with the idea of staying a child forever. In fact one of the very themes of The Magic Kingdom is that everyone is young at heart! Peter Pan is a character everyone can identify with and enjoy. The ride itself is also quite unique. You begin by boarding a pirate ship and the cast member sprinkles pixie dust to lower the safety bar then you are off…off to Neverland that is! Through the Darling nursery, out the window and off on a journey into the night. For me one of the most incredible things, is looking down over the streets of London and actually seeing the little cars moving on the street below. Then you are shifted from the world of reality to the world of fantasy. Mermaids in aqua colored lagoons, Indian Princesses, hungry crocs, lost boys, pirate fights, and of course daring rescues! Its all here inside this ride! It is a dark ride the entire family can enjoy and I think this is what keeps the crowds coming back! What is your favorite ride in Fantasyland? 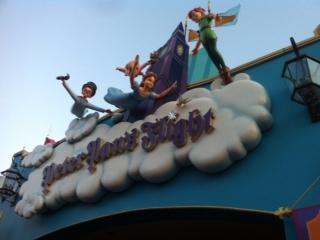 This entry was posted in Attraction Spotlight, Fantasyland, Magic Kingdom, My thoughts and tagged fantasyland, magic kingdom, Mermaids, Neverland, peter pan. Bookmark the permalink.